Having experienced a couple of chronic back conditions and a recent car accident myself, I know what it is like to be slowed down by pain and injury. I know first-hand what injury and chronic pain do to peoples' lives. So, when I have a long day ahead of me, I bring Aleve. It can take care of my muscle soreness, aches and pains as well as my friend's minor arthritis pain. 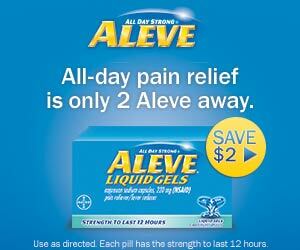 If you're like us and you don't have time to be slowed down by pain, just two Aleve can relieve your pain all day. Each pill can last 12 hours. Oh, and don't forget to print your $2.00 coupon for your next purchase! NOTE: Save $2.00 off any Aleve 80ct or larger (excludes Aleve-D products).